Welcome to the SU Stars Blog Hop on Gift Giving Ideas! You should have come here from Jane Hignite's blog at www.stampwithjane.com. If you get lost or you want to make sure you've seen all the projects, you can always go to the start of this blog hop by going HERE. I'm sure you've been getting some great ideas from all of the stampers on this hop! I had a lot of fun coming up with my projects to share with you. I have three for you! Are you ready to see? 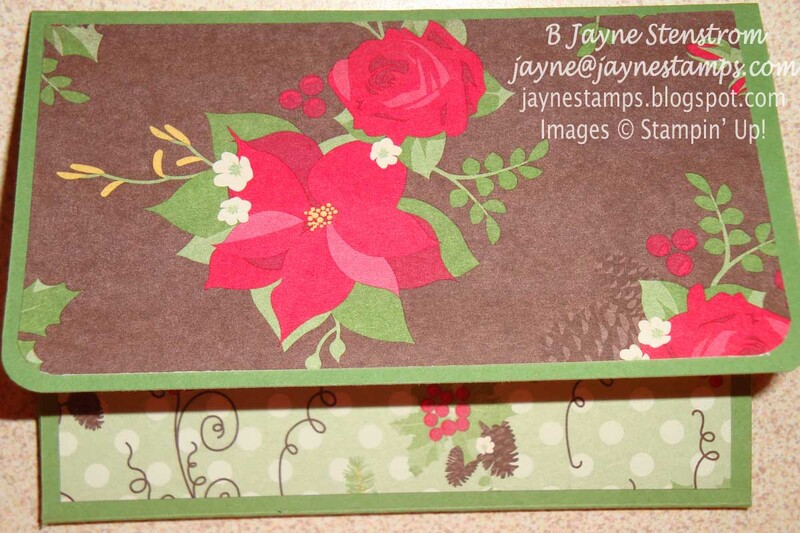 I repeated a lot of the same elements on these projects including Holly Berry Bouquet Designer Series Paper, Red Glimmer Paper, and the Top Note Die. I have instructions below if you're interested. Just be forewarned that there are a LOT of pictures here! 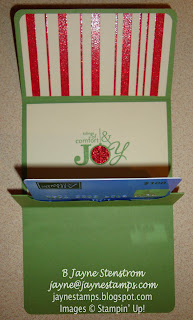 My first project is a gift card holder. 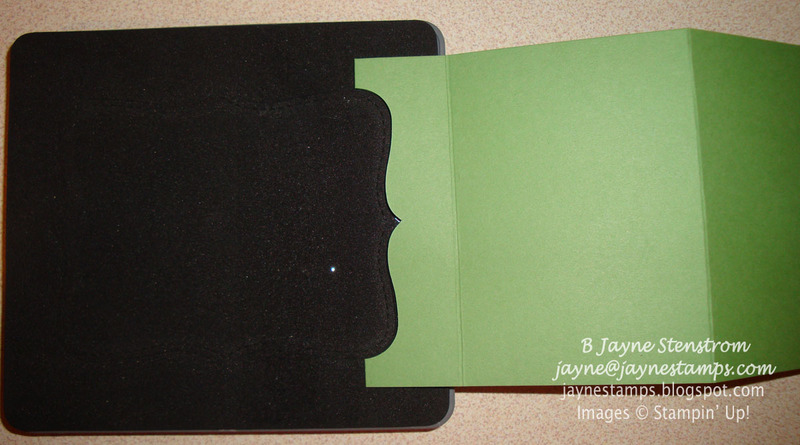 I started with a piece of Wild Wasabi cardstock cut 4-1/4" by 10-1/2". I then scored it at 3", 4-1/4", 5-1/2", and 8-1/2". 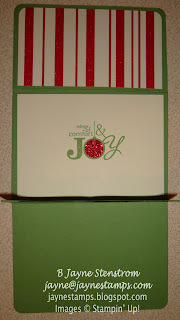 The cardstock was then folded on the 4-1/4" mark and cut out with the Top Note Die. 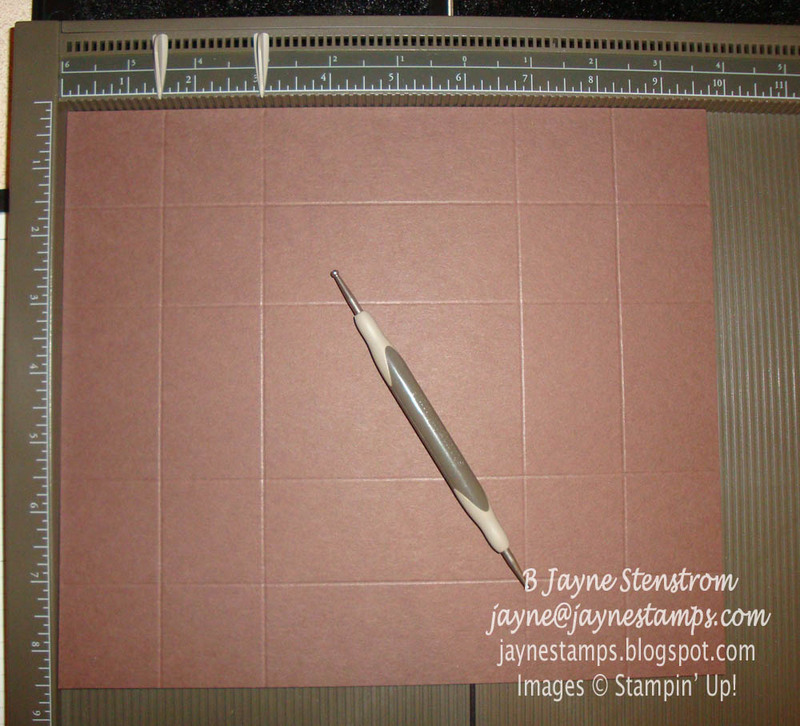 Below is a picture as to how you place the fold of the cardstock on the die. 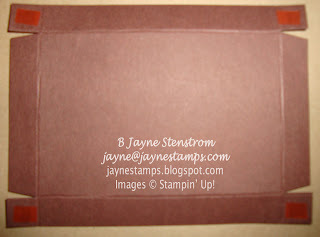 When you open the cardstock back up, this is what you should have. 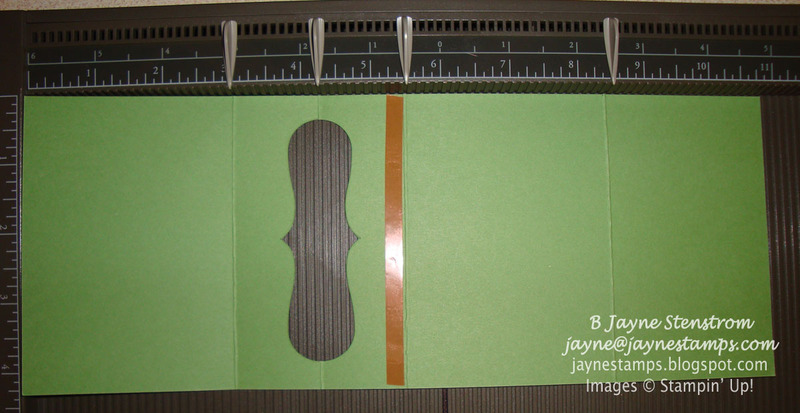 Run a piece of Sticky Strip just inside the fold line where you cut the opening with the Top Note. Stick together with the Sticky Strip. 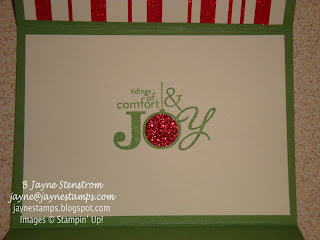 You can also tape that smaller section together before you cut it with the Top Note die. Notice the little extra bling I added on the saying? I just used my 1/2" Circle Punch with the Red Glimmer Paper to add some more sparkle! My next project is a little gift box using the Top Note die for the top and bottom of the box. 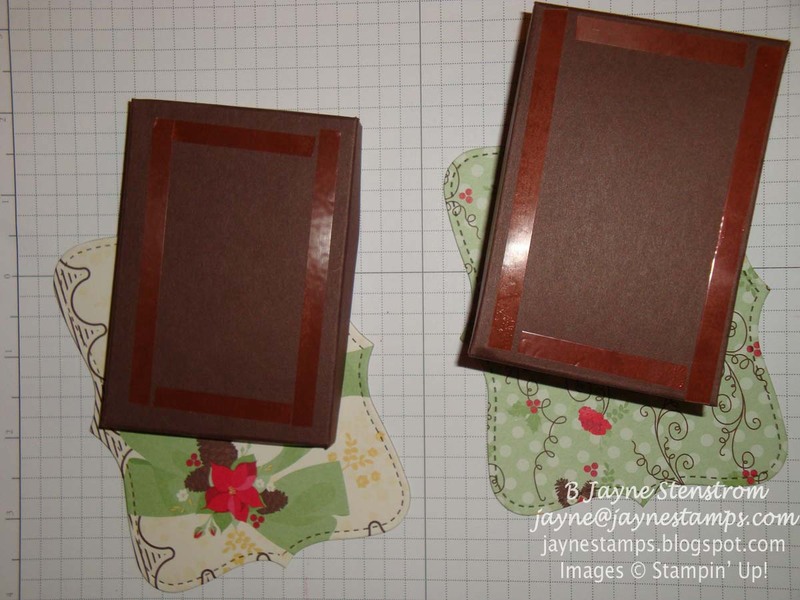 Cut two pieces of chipboard or heavy cardboard to 4" x 5". Cut FOUR pieces of Holly Berry Bouquet DSP the same size. 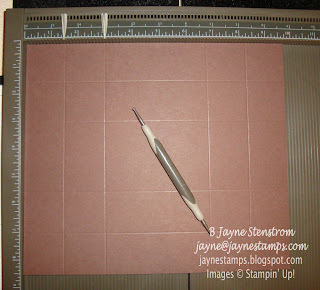 Using the Anywhere Glue Stick or Tombow Multi Purpose Adhesive, glue the DSP to BOTH sides of the chipboard. Set aside to dry well. 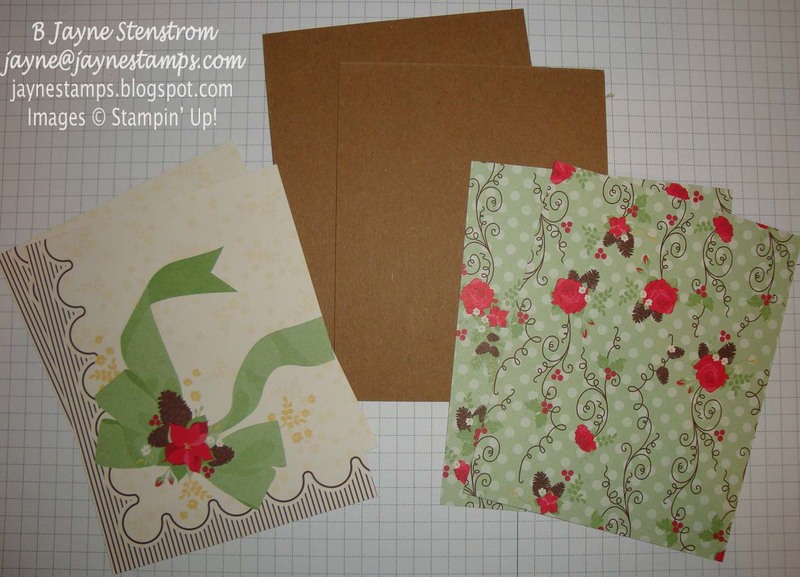 Meanwhile, cut cardstock for your box to 8-1/2" x 9-3/4". Score on all four sides at 1-1/2" and 3". Cut on the score lines as shown below and apply Sticky Strip as shown. The box will go together easier if the flaps being folded in are trimmed on an angle. 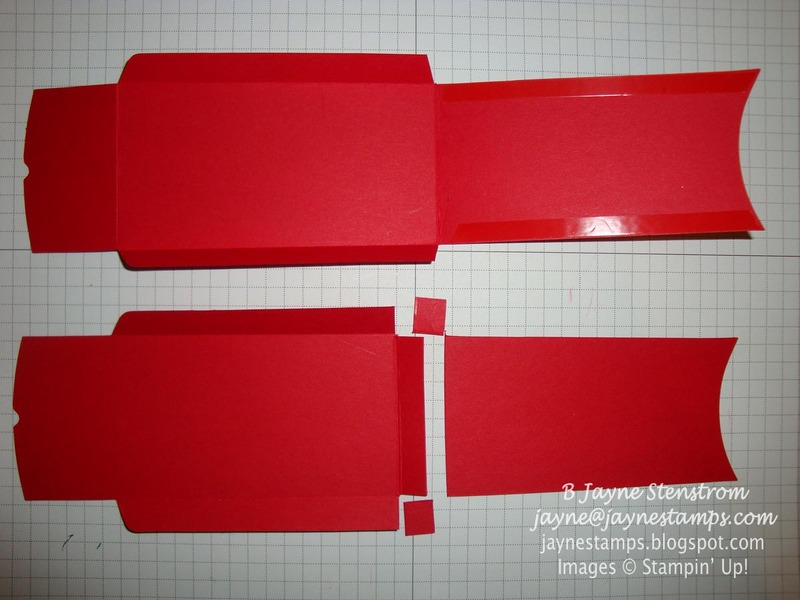 Fold in the small flaps first, then fold in the long flaps. This makes your box. 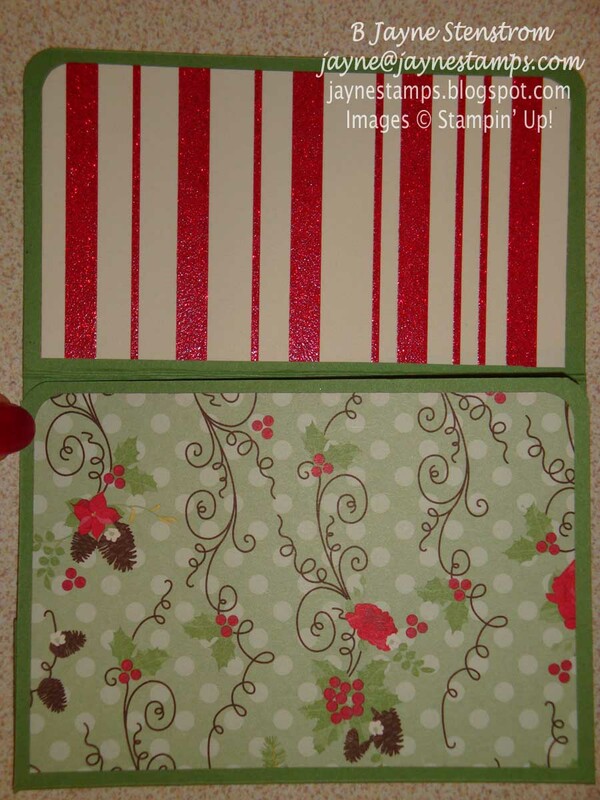 Add some Sticky Strip if you need to hold down the inside edge. For the lid, cut your cardstock to 3-5/8" x 4-7/8". Score in 1/2" on all edges. 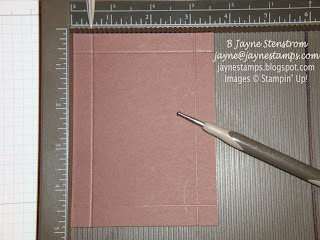 On the long sides, cut in 1/2" to the fold. 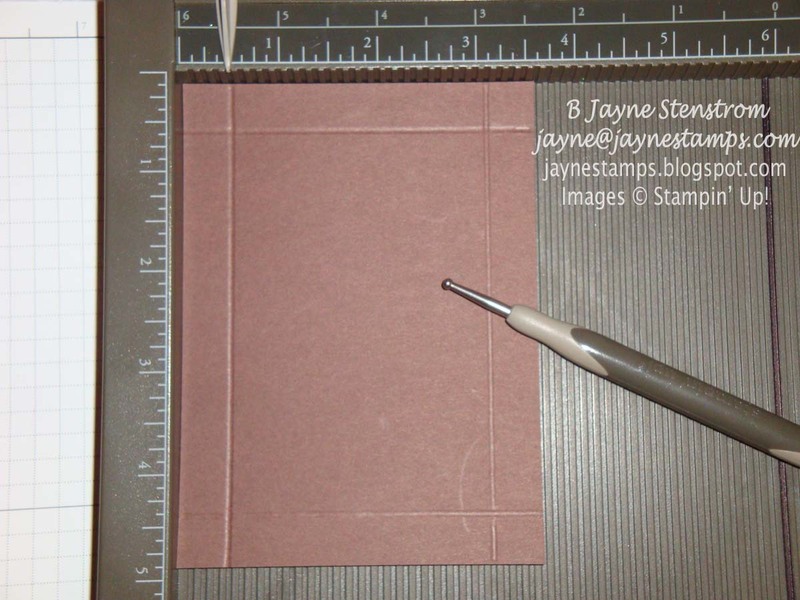 Place Sticky Strip on the small 1/2" square flaps. Fold together to create box lid. 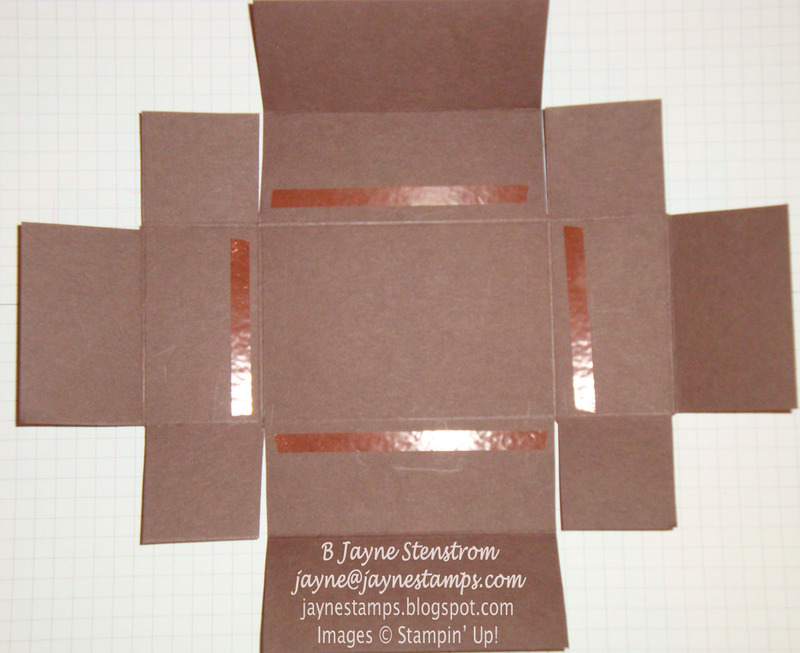 Take the pieces of chipboard that you glued the DSP to and run them through the Big Shot with the Top Note die. 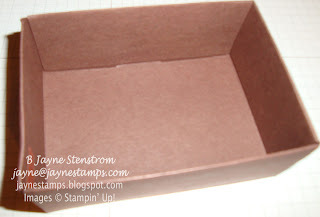 Place Sticky Strip on the bottom of the BOX and the top of the LID. Remove the Sticky Strip from the box and lid and attach your Top Note chipboard pieces. 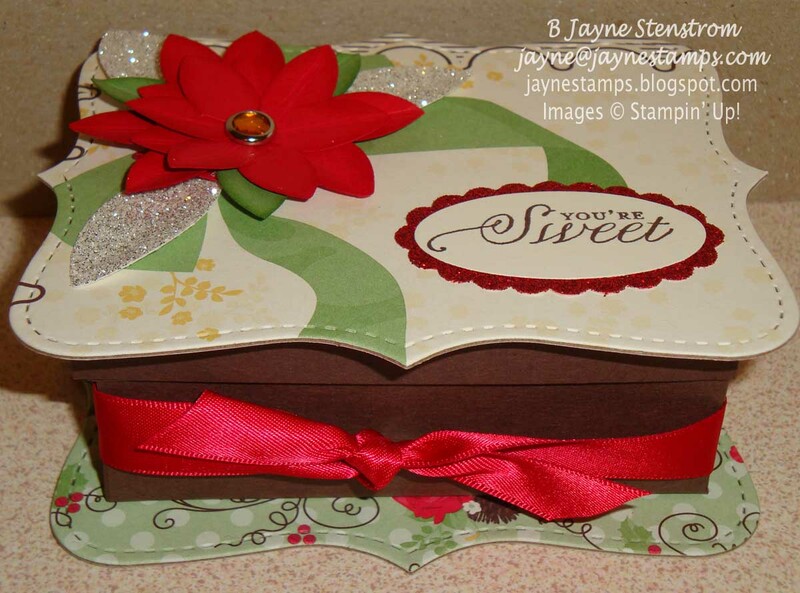 Decorate your box as desired. 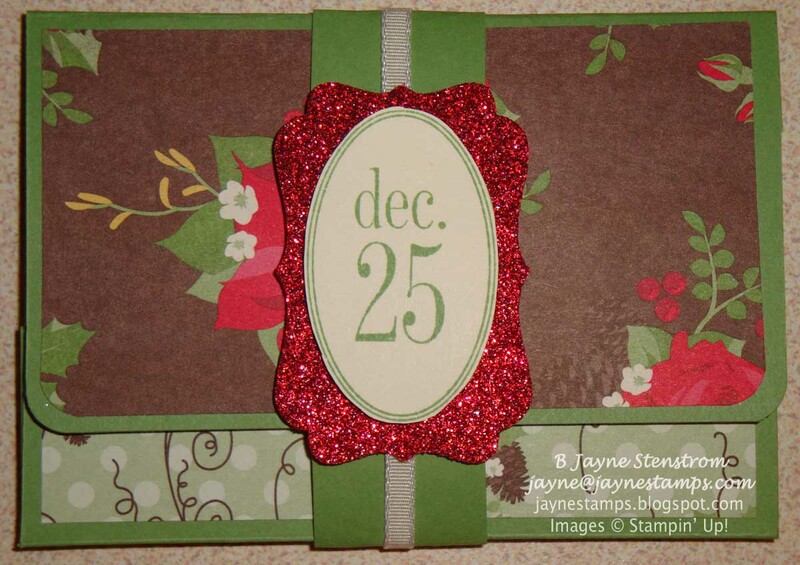 My poinsettia was made with the 5-Petal Flower Punch, Real Red and Wild Wasabi cardstock, and a Circle Fire Rhinestone Brad in the center. To add a little more shimmer, I punched out three petals with Silver Glimmer Paper using the Blossom Petals Builder Punch and tucked them behind my poinsettia. 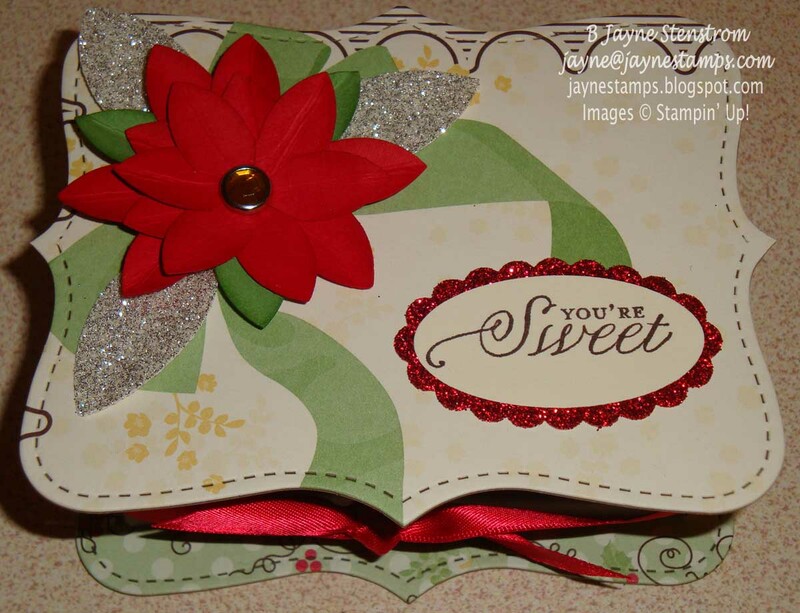 The You're Sweet sentiment is from You're Cherished (pg. 193 IB&C). 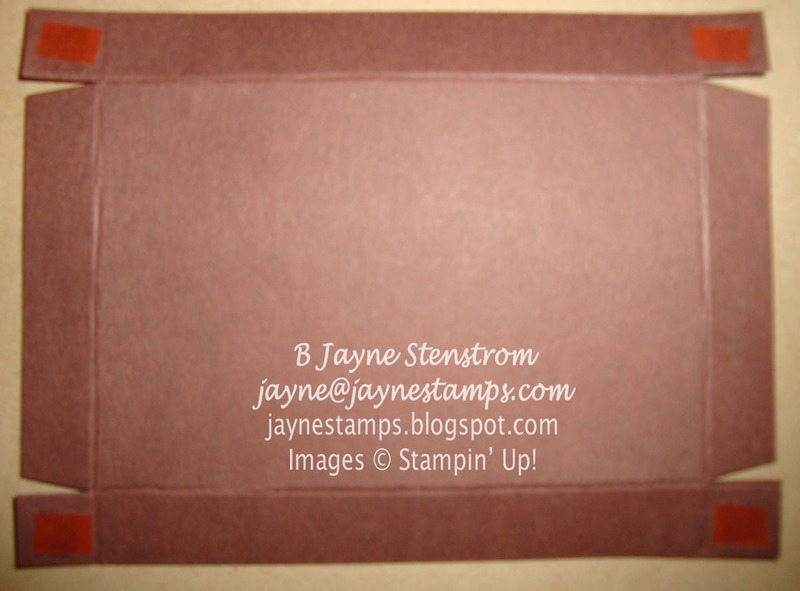 Finish off by tying Real Red 5/8" Satin Ribbon around the box. 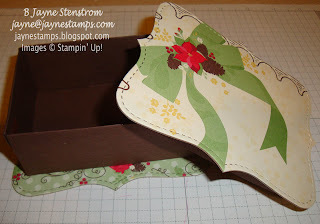 And my last project for this hop is another gift card holder, but this one is made with the Holiday Stocking die, the Stocking Accents die, and the Petite Pocket Bigz XL die. 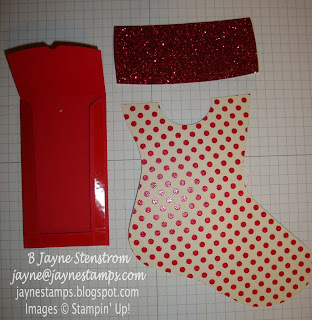 Cut out one of the Petite Pockets from the die. 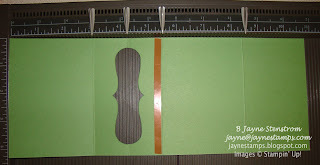 In the picture below, the top one shows the Petite Pocket as it is originally cut. For this project, you will need to cut off the bottom section except for about 1/2" piece and then cut away the corners. 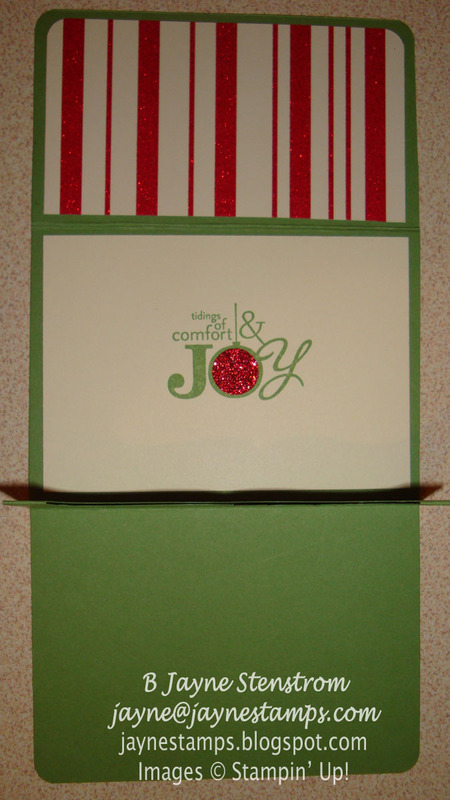 Fold in the edges of the Petite Pocket. 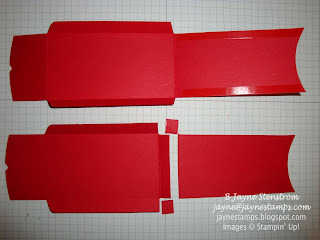 Put Sticky Strip on the two long flaps and across the bottom. 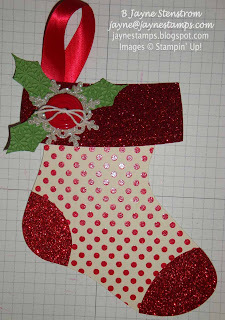 Cut out stocking images with the Holiday Stocking die. I used the Holly Berry Bouquet DSP for the main part of the stocking and the Red Glimmer Paper for the top, toes, and heel. Punch a half circle in the top of the stocking and stick the Petite Pocket to the back side of the stocking with the fold for the pocket at the top of the stocking. 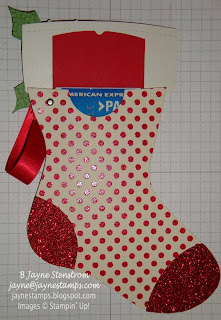 Fold the top flap of the Petite Pocket to the front of the stocking and adhere the stocking top to this part of the Petite Pocket. 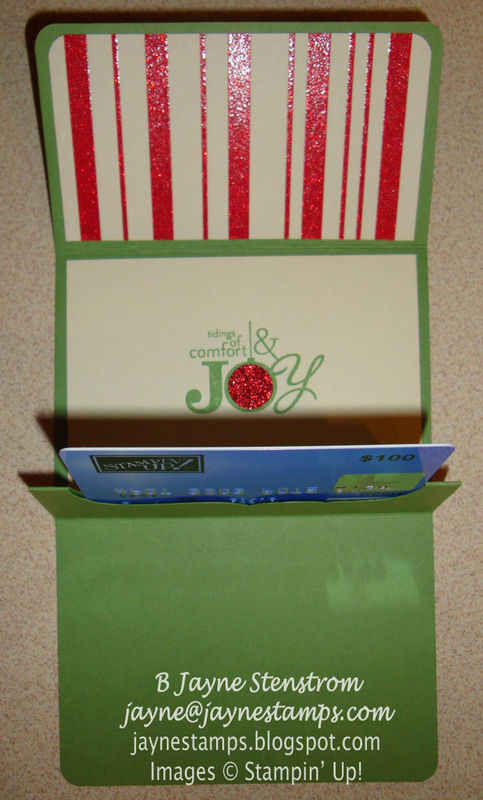 This is what it looks like from the inside (with a gift card inside). 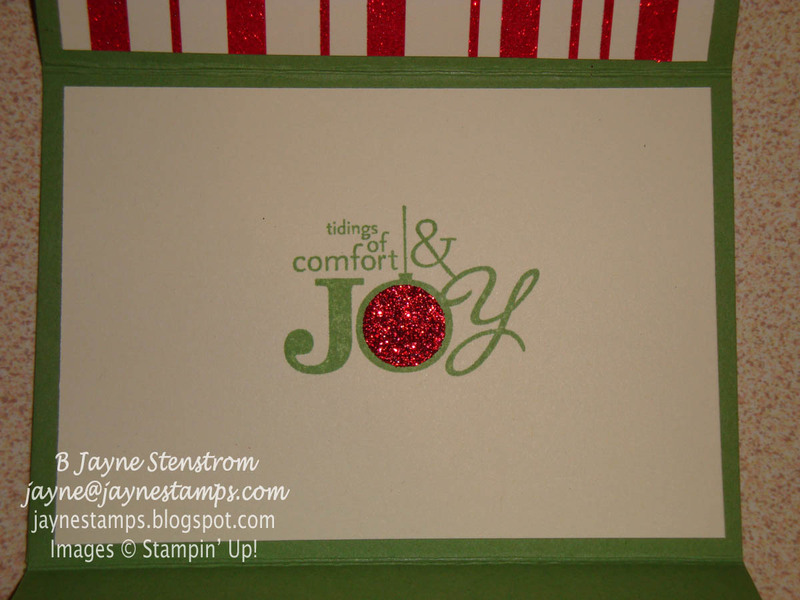 I hope you've enjoyed my glimmering and shimmering projects! Feel free to leave me any comments or questions below. If you have a question and would like an answer, please include your e-mail address in your comment. Otherwise I don't have any way to contact you. Comments are always appreciated!! http://sharisstamppad.blogspot.com/2011/11/sustars-blog-hop-november-2011-gift.html. She's made some adorable items that hold CHOCOLATE!!! Jayne, you ROCK. Each and every one of these projects is fantastic. Thanks for sharing the instructions on all of them. The only thing that would be better would be sending them all or even one to me!! Great shares! Thanks for taking the time to post the directions! 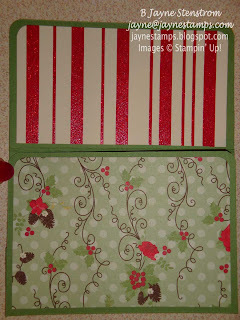 Wishing now I would have got the petite pocket die....looks like I'll have to add that to my next order. Great ideas! Thanks for the tutorials. Loved all your boxes and the pictorial instructions!!! Beautiful boxes. I have made the top note before, but never like that.. I think your's is easier to make!! Lovely!! Love it all! Great stuff. Jayne: these are incredible!!! And the fact that you detailed the instructions for us is beyond generous--thank you! 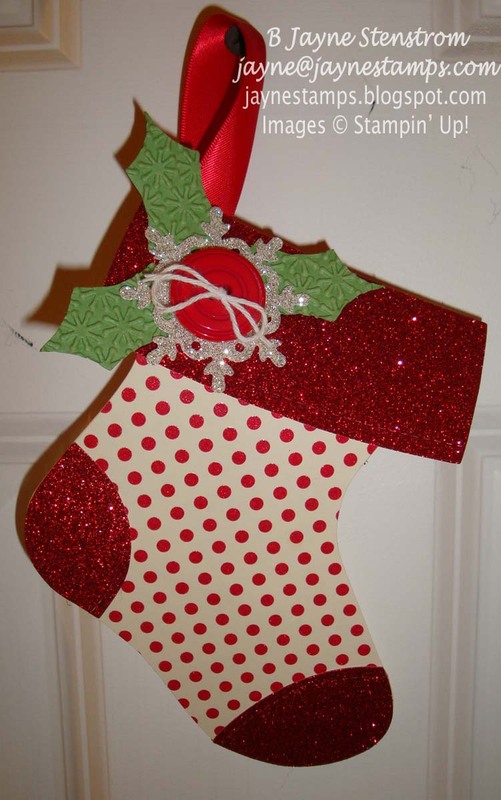 Your projects are adorable. Love your use of the red glitter paper, too. Thanks for the instructions with pictures. 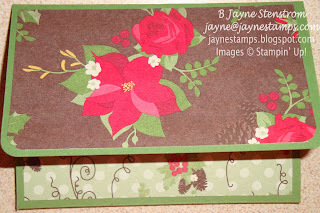 Jayne I love every single one of your projects! I'm going to have to spend more money on Big Shot dies I can see! 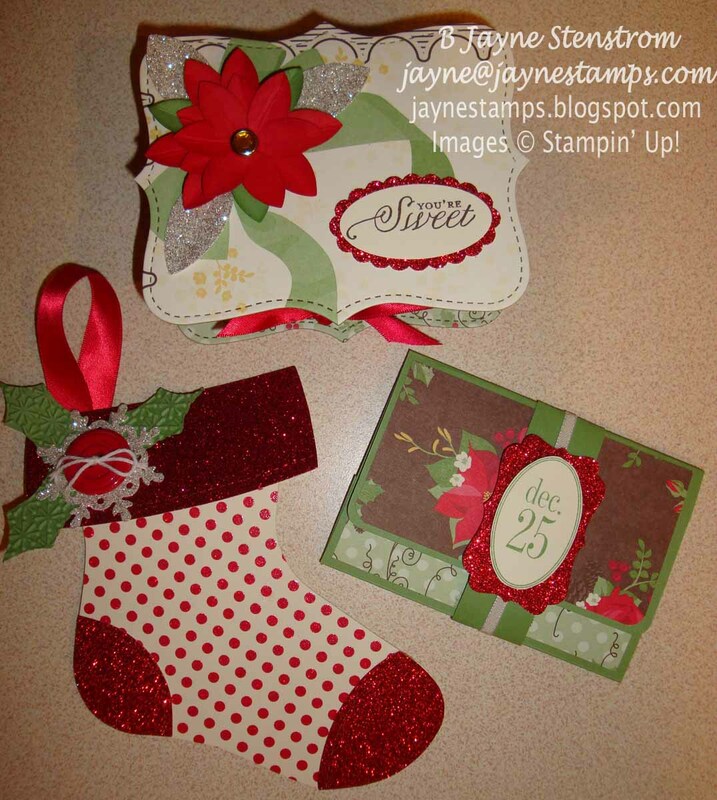 awesome projects Jayne. I love them all. Thank you for the tutes for your projects. Into my favorites this post goes. Loved all of these gift card holders. TFS!